What questions and points does it address? It has been reported that after the 2007 Letter was published, many Catholics in the underground Church had expressed disbelief and disappointment that the Vatican had ignored their needs for the sake of improving relations with China. Certainly they were questioning whether collaboration with the Patriotic Association is necessary as the ‘lesser of two evils’ and the era of the underground Church is truly being declared over. “Does the Holy Father really want this?” the underground Church is asking. “Please, tell us this isn’t so.” The Compendium clarifies that this is exactly what he wants. 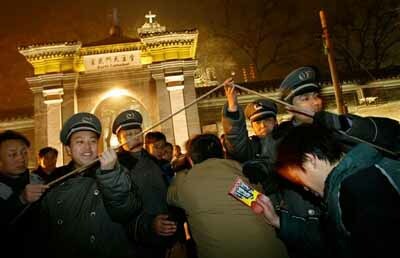 Then there is the Chinese Communist government whom the Vatican is wooing. Did they require further verification and a clearer message that Rome would swallow Communism to open relations with Beijing? If so, they received an affirmative answer with the recent Compendium, which confirms the call for reconciliation of the Catholic Church with Communism. 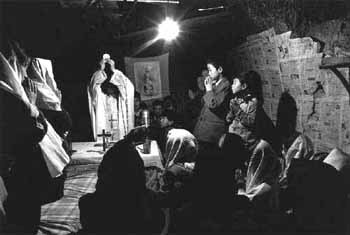 Applying Vatican II, the document tells the heroic Catholics of the catacombs that the Catholic Church in China cannot be divided into two churches - the communist directed one and the underground Church. There should be only one Catholic Church encompassing both. This was, it clarifies, Benedict’s desire in his 2007 Letter. What it proposes is an absurd church composed of both the persecutors and the persecuted, which would be the one Catholic Church in China. Now, how can we have the Chinese Patriotic Association, established to exercise State supervision over mainland China's Catholics, given equal footing as part of the “Church of Jesus Christ”? Such proposition aims to deliver the faithful Catholics to the wolf. Thus, if any doubt could remain that Benedict wanted to deliver the underground Catholics to Communism, this new document, with a few strokes, puts it to rest. The underground Church is wiped off the map. There is just one Catholic Church in China. The bishops and clergy of the Patriotic Association who have registered with the Chinese Communist government are granted the same status as the heroic bishops and clergy of underground Catholic Church who have suffered persecutions and martyrdoms to remain faithful to the Holy See. It is a cruel slaughtering of the innocents. In footnote 2 of the Compendium, how to achieve the desired “reconciliation” is more clearly laid out. The document states: “It is by means of practical steps that spiritual reconciliation, including visible reconciliation, will gradually occur, which will culminate one day in the complete structural unity.” Until that time, this “path of reconciliation” cannot be limited to the spiritual realm of prayer alone, but must be furthered by practical measures such as exchange of experiences, sharing of pastoral projects, common initiatives, etc. Clearly it is not the Communist Patriotic Association that is being exhorted to go underground to participate in common initiatives with the persecuted faithful Catholics. No, indeed! The faithful Catholics are told to adjust to the demands of Communism and enter into common projects with the Patriotic Church. The message is unambiguous, and, just to be sure, the commentary insists that these “necessary” steps cannot be postponed “on the pretext that they are difficult since they require the overcoming of personal positions or view.” That is to say, opposition to Communism, now downgraded as a personal preference, cannot be an excuse to reject the new Vatican policy in China. This 2009 Compendium, like the 2007 Letter, says that registration with the government is acceptable as long as it does not compromise principles of the faith and “Church communion,” or force Catholics to perform actions contrary to their consciences. How is it possible not to compromise principles of the faith when the Communist government which directs the “official church” denies Catholic teaching on private property, abortion, contraception, to name just a few things. Further, the Chinese government abhors the authority of the Pope and qualifies it as an external interference in national affairs. In effect, to register with the government is ipso facto to accept principles that compromise the faith. Nonetheless, the Compendium affirms that the Pope’s Letter meant to encourage the underground faithful and clergy to “abandon the clandestine condition” – which is “not a normal feature of the Church” – and do exactly that. It is impossible to avoid the consequence that this new document, which confirms Benedict’s Letter, was made to strongly pressure those Catholics who still resist being delivered to Communism. It would seem that there was some confusion on the matter whether underground Catholics should receive sacraments from bishops and priest of the Patriotic Association. Most likely, some leaders of the underground Church were interpreting Benedict’s Letter to inform the faithful they should avoid the services of such bishops and priests. The new document also sabotages this policy. The Compendium makes it clear that individual Catholics have a broad latitude in deciding whether or not to receive the sacraments from government-recognized bishops and priests who have not requested recognition from the Holy See. Footnote 6 also tells underground Catholics that the doors are open to the them to find spiritual sustenance from the Patriotic Association. If they cannot find pastors in communion with the Pope and if they feel they need the Sacraments at that moment for their spiritual good, then the final decision on whether or not to receive them is up to the individual. Again, it is another invitation to compromise their principles and accept Communism. For readers who may question my interpretation of this Compendium and Benedict’s Letter, I invite them to read the documents for themselves or, at least, to read the headlines of Catholic agencies reporting on this document. They speak for themselves about the Letter’s and the Compendium’s message: “Papal letter to Chinese Catholics seeks to unite divided communities” (CNS), “Pope's letter opens door to unity in China” (CNA), “Compendium of '07 Letter Helping Chinese Unity,” (EWTN) “New Vatican document again encourages Chinese Catholics to reconcile” (CNS). I’m afraid I can’t quote headlines from the traditionalist press on this issue because its journalists have been shamefully silent. I believe it is because in this appalling matter, there is no way to excuse or reconcile the actions of Benedict XVI. 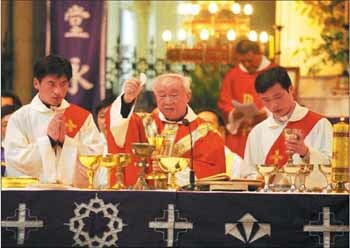 In 1997, the Cardinal Kung Foundation published a secret Chinese government document entitled "The Procedures Legally to Implement the Eradication of Illegal Activities/Operations of the Underground Catholic Church." The document recommended steps to be taken to destroy the Underground Roman Catholic Church that included "destroying the organization of the Catholic underground forces," "cutting off foreign contacts with local illegal elements," and "destroying the Church's illegal assembly place[s]." We see that as the Communist authorities plot the destruction of the Underground Catholic Church, the Vatican itself comes to assist them with the 2007 Letter of Benedict XVI and the recent Compendium.